There are so many elements to landscape design. Most people think of a clean cut lawn, trimmed hedges, blooming flowers, and even some hardscaping elements such as retaining walls and edging. However, many people overlook a very important part of landscape design – landscape lighting. Of course you want your yard to look gorgeous when the sun is shining, but what about after dark? Do you simply cease to use and look at your landscaping once the sun goes down? Of course not! When weather permits, outdoor areas are great for entertaining or just relaxing with your family, and well-designed outdoor lighting can really take your landscape design to the next level. Getting started with a landscape lighting plan is easy, just begin by asking yourself a few questions. It’s important to consider how your landscape will be used throughout the year. While some people like to keep the front yard pristine and move parties to the backyard, you might be the complete opposite. Think about how you view and use all of your landscaping. If you love to sit outside in your front yard, you might want to add a paved area so you have a level surface to place chairs. If you enjoy hosting barbecues, you might want to have a large patio in the backyard. Once you know how you want to use the space, you can go about planning the need for lighting. For example, if you decide on a paved walkway to your door or patio, you can install lighting along the path to light up the way. For people who love to host outdoor parties, outdoor sconces, pathway lights, and even some decorative overhead lights are a must. You can’t party if you can’t see past sundown, right? What function will the lighting serve? A lot of landscape lighting serves an important function. 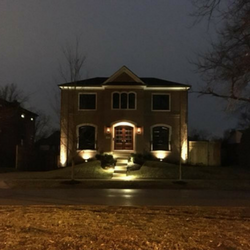 Porch lights ensure that you and your guests can easily locate doors, pathway lights help guide people as they walk, and spotlights can be used to highlight features or areas such as trees, sculptures, or fountains. Of course, lighting doesn’t have to be strictly functional. Landscape lighting can increase visibility in the dark while also adding an artistic aspect to your yard. You can play with the color of the lights, their placement, and even the hardware that houses the light in order to enhance the look and feel of your lighting design. Hanging lights are also a great way to make a simple space look elegant. How will it look during different times of the day? Obviously, landscape lighting is designed to be used at night, but you should also consider how it will look during the day. No one wants their yard to be burdened with a light fixture that’s an eyesore. Landscape design encompasses the full picture, so you will want to consider how any outdoor lighting you install will affect the look of your yard during different times of the day. Will the large fixture cast a strange shadow over your garden and affect the growth of your plants? Is the pathway lighting subtle enough not to look bulky but also obvious enough to not be a tripping hazard during the daytime? These are important things to discuss with a landscape lighting professional, like the experts at Hackmann Lawn & Landscape. The bottom line is, you need outdoor lighting that looks beautiful at any time of the day and also provides the amount and style of lighting you want for your home. Whether you are looking for soft and subtle lighting for night time parties, bright spotlights for security, or anything in between, we can help! Check out our landscape lighting inspiration ideas, or contact us to discuss your space. We love doing custom work and will happily design something that works perfectly for you.